Disclosure: We were given two complimentary tickets to help facilitate this post. No other compensation was given. All opinions are my own. This year was a big birthday for the Sugar Snaps. It took me a long time to decide what to do for their birthdays because I was wrapped up in the magic of having four turning four! Then, it hit me. 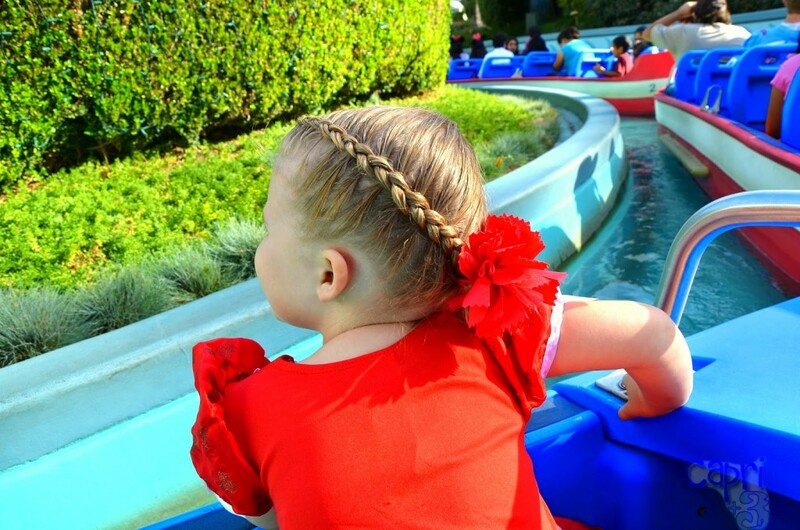 They loved our previous experiences at Disneyland and California Adventure when they were two, but they are now at an age where they are ready to experience the wonderment at a new level. We decided to spend one day, splitting our time between both parks. Greg and I had never been to Disneyland during the holidays and were pleasantly surprised by all of the festive decorations everywhere. Our first ride was the Dumbo ride. They all enjoyed the experience of flying and watched the ride for a while after they got off. We took every opportunity we could to meet the characters that the Sugar Snaps know and love. 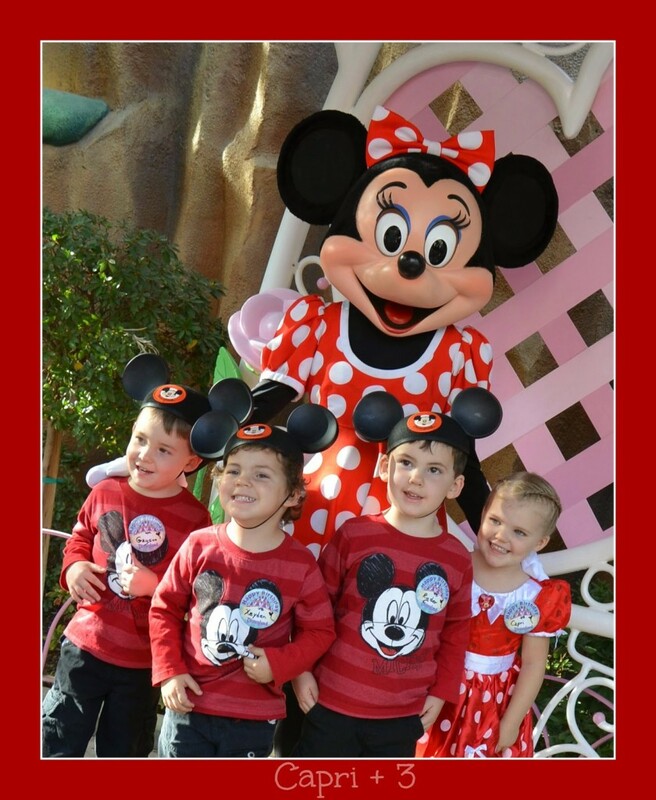 They are especially fond of Mickey and Minnie Mouse and were dressed to match. 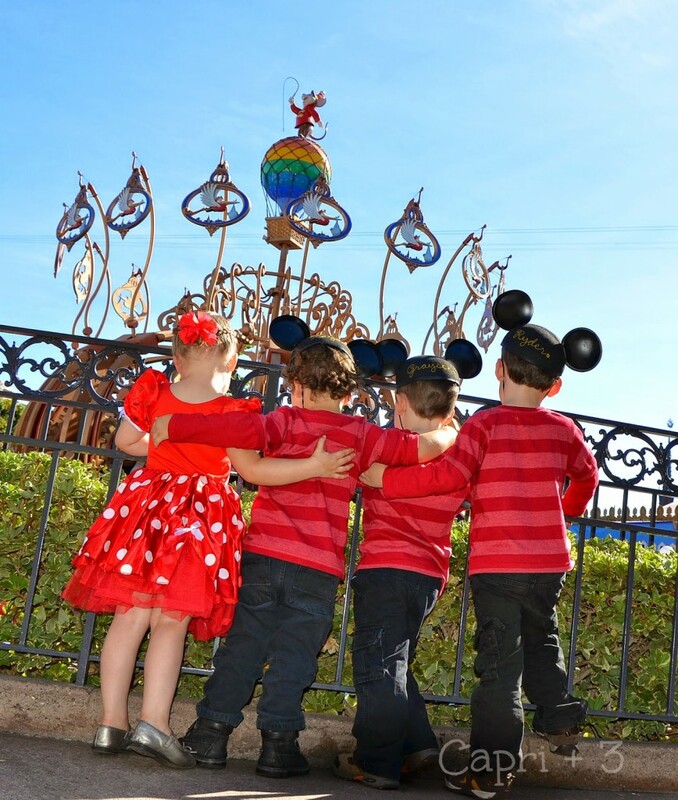 They could hardly wait to meet Minnie! 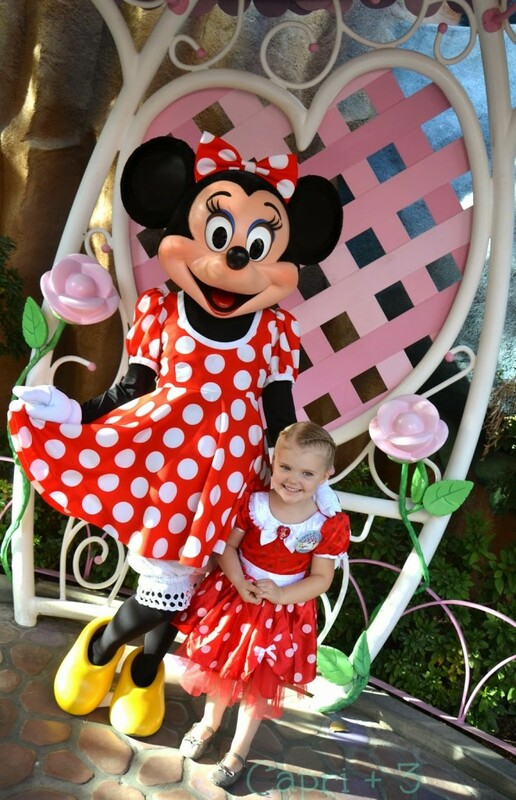 Capri was especially excited that Disneyland cast members called her Minnie throughout the day. They had plenty of birthday wishes too as they wore their free Happy Birthday buttons. If you decide to do a birthday at Disneyland, make sure to pick up a free button to the left of the entrance by City Hall. It is so fun for them to receive birthday greetings throughout their stay. This moment was the highlight of Capri’s day. We had no idea that they transformed the inside of the Small World ride until our boat floated inside. 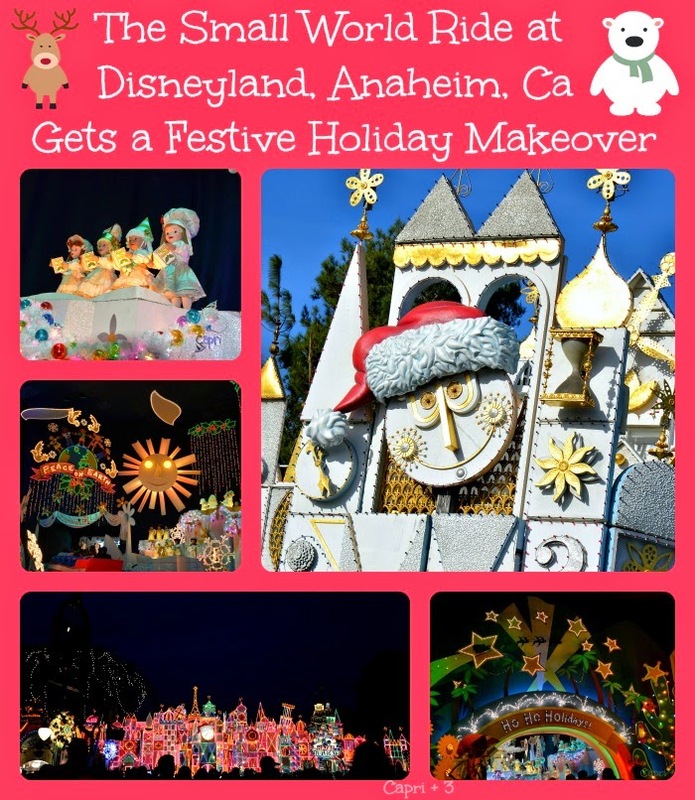 We were amazed that everything changed for the holidays to reflect festive lands around the globe. Even the songs changed for the holidays! Capri was still captivated as we emerged from the ride back into the sunlight. 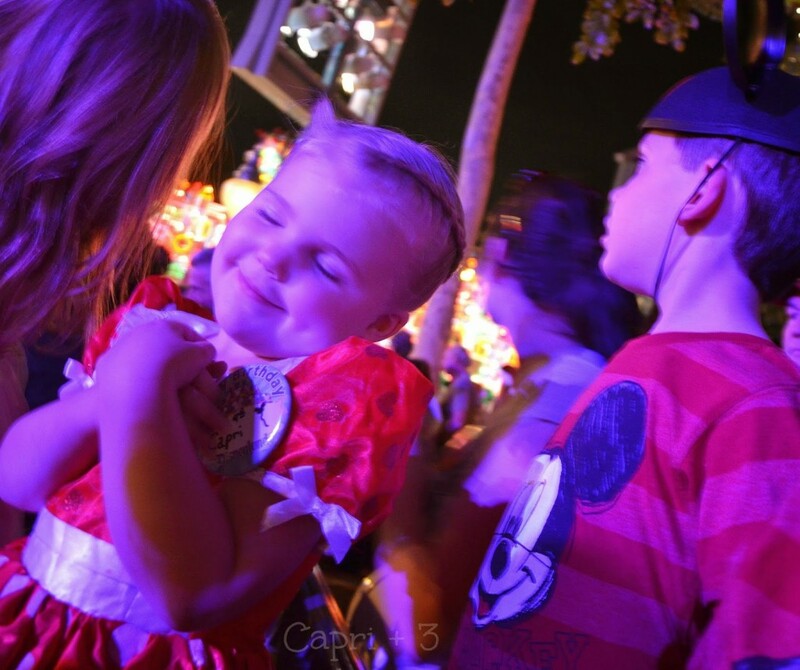 This captures how they felt while watching the Christmas Fantasy Parade at Disneyland. We spent the rest of the time exploring California Adventure where they enjoyed the Cars themed rides and Ariel’s Undersea Adventure. They also loved riding the Carousel. We pretty much closed the place down. At the end of the night we stopped at one of the many cafe’s and ordered a snack before heading home. On the way home, before they fell asleep, they professed that they had so much fun and wanted to come back every day. They continued to inquire about making this a daily event for another week! I still can’t believe our ‘babies’ are four years old. 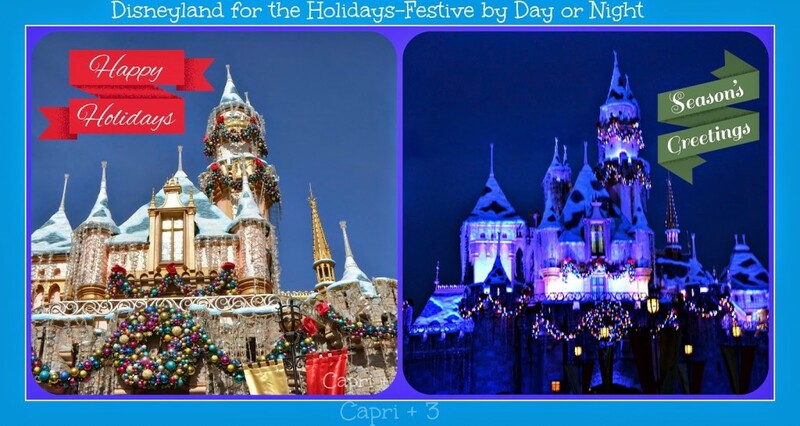 Have you ever been to Disneyland or Disney World? What time of year did you go? I would love to read about your experiences in the comments. We had year passes one year, my father in law won them, when our kids were about 5 & 9. What a lot of great memories. We did the character breakfast which I highly recommend. The story book readings in the shops were a big hit at that age too. I am so glad you had a great time. Thank you. Year passes would be a lot of fun. Then, you can do the things you love again and again. We will have to try the character breakfast. They would be really excited. I did not know about the story book readings. I will have to find out more about that. Thank you for the great info and for sharing about your experiences. Omg what a fabulous way to celebrate a fourth birthday!!!! Happy birthday!!!!! I wish I could make magic happen every day of the week Mrs. FF! They truly had a magical day. These photos are totally awesome. You must have brought a really good camera. My kids haven't been to any of the Disney locations, but I know they would love it this much too. What a fun day, I can't wait to take my little one to Disneyland! It looks like they had a wonderful time! Happy birthday to your little ones. We haven't taken our babies to Disney yet but I look forward to our first trip! It was fun! 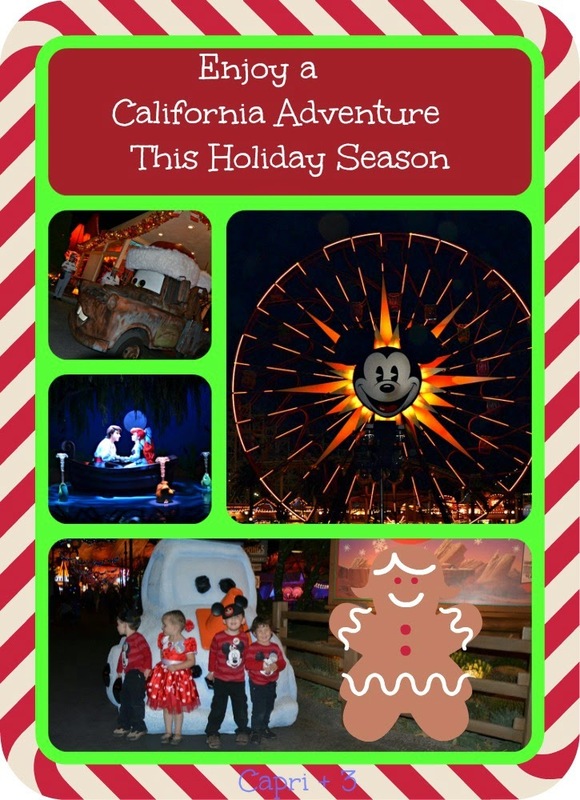 I am sure your little one will LOVE Disneyland. I imagine your babies will love it. And…it is free for children under the age of three which is awesome! We have never been to neither of them. I love how the kids were dressed. It looked like they had a very magical time. I love how it was decorate for Christmas. It was fun to see all of the holiday decorations. If you ever get the chance, I would recommend going. Thank you. I did bring my good camera. I wanted to capture it all. I hope your kids get the chance to experience it in the future. 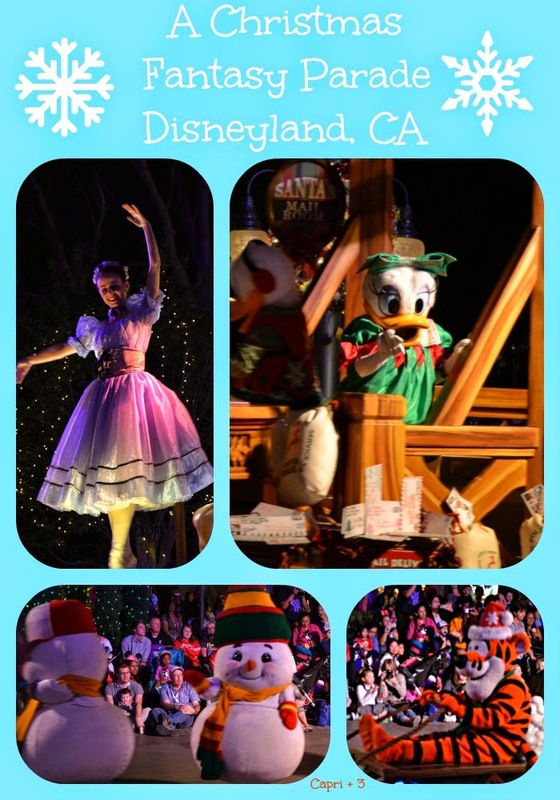 We are lucky that we live so close to Disneyland. Great pics! 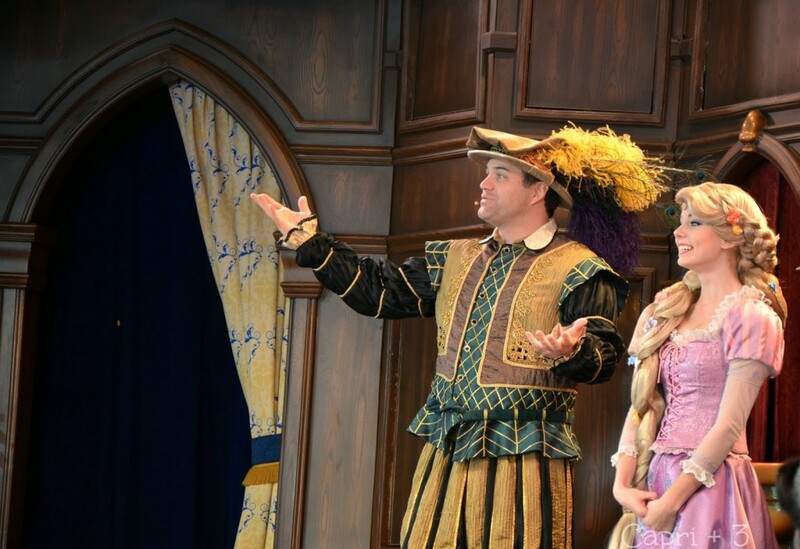 I have never been to Disney, and that's maybe a good thing – I think if I go once I will want to go back multiple times per year! Someday when my girls are older I'll definitely plan a trip to Orlando though. I hear you on that. It could be addictive! I imagine your girls will love it when you go to Orlando some day. Disneyland does do a great job with birthdays. And…there is no set up or clean-up for parents which is a bonus! They continue to talk about how fun it was and how much they want to go back. It was a really fun celebration. Oh, wow! I love everything about this. Your kids are adorable! Did you do Capri's hair like that? I need a tutorial! And, is there anything better than celebrating your birthday in Disneyland? Nope! 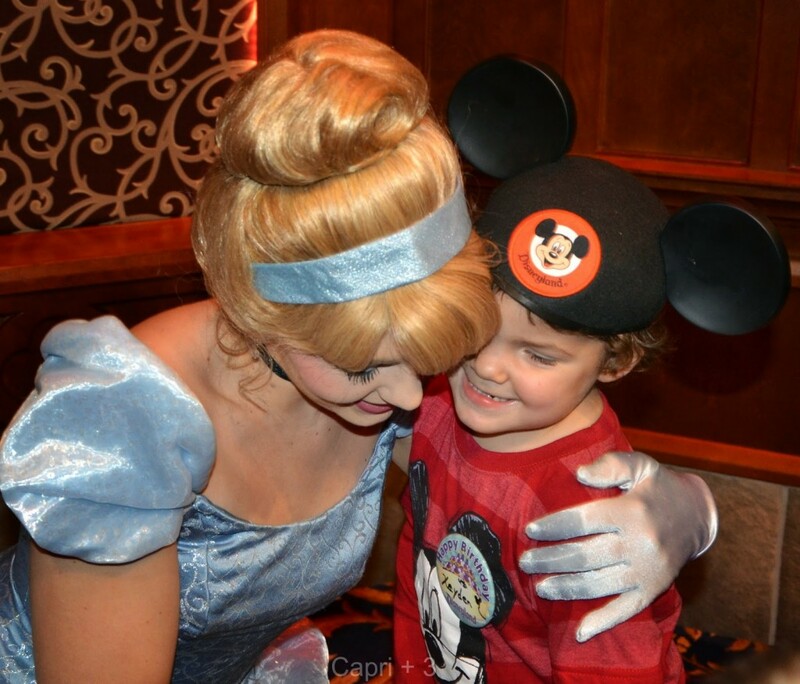 I think Disneyland captures magic for all ages. Your children will have a blast. And you have children of different ages who will experience it in different ways. It will be fun to see it through their eyes. 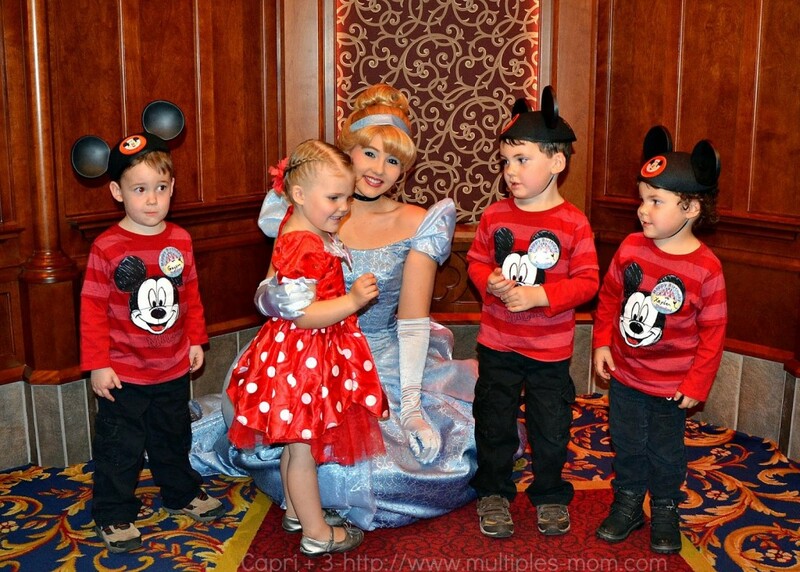 Your children are absolutely adorable in their Disney gear! Such a fantastic way to spend their 4th birthday! We had so much fun celebrating their birthday. They still hope we will say 'yes' when they ask if we can go to Disneyland each day.